Once the shareholders and the Supreme Court approve, Acreage Holders will immediately receive a payment of US$300 million or approximately US$2.55 per Acreage Subordinate Voting Share. The company also said in a statement that holders of subordinate voting shares of Acreage will get 0.5818 of a common share of Canopy Growth stock for each Acreage Subordinate Voting Share held at the time of closing of the transaction. Complex is an understatement. These companies are based in different countries with varying levels of shareholder ownership and voting rights. Add in the inclusion of Constellation Brands (STZ) and it becomes more complicated. Plus, there is the issue of legalization in the U.S., which it seems both companies are confident will happen sooner rather than later. Shareholder approval is expected to occur in June. Acreage President, George Allen will depart the company effective immediately and Acreage Chairman and CEO Kevin Murphy will assume the duties of President. The Acreage board has approved of the deal, but there wasn’t any information as to whether the well-known directors like former Speaker John Boehner, former Canadian Prime Minister Brian Mulroney and former Massachusetts Governor and current Presidential candidate Bill Weld will be on the new board. Acreage Holders will hold approximately 12.1% ownership in Canopy Growth (on a pro forma basis) and up to 16.6% if permitted acquisitions are completed prior to the Trigger Event. The companies said in the statement that they will also execute a licensing agreement granting Acreage access to Canopy Growth’s award-winning line-up of brands such as Tweed and Tokyo Smoke, along with other intellectual property. 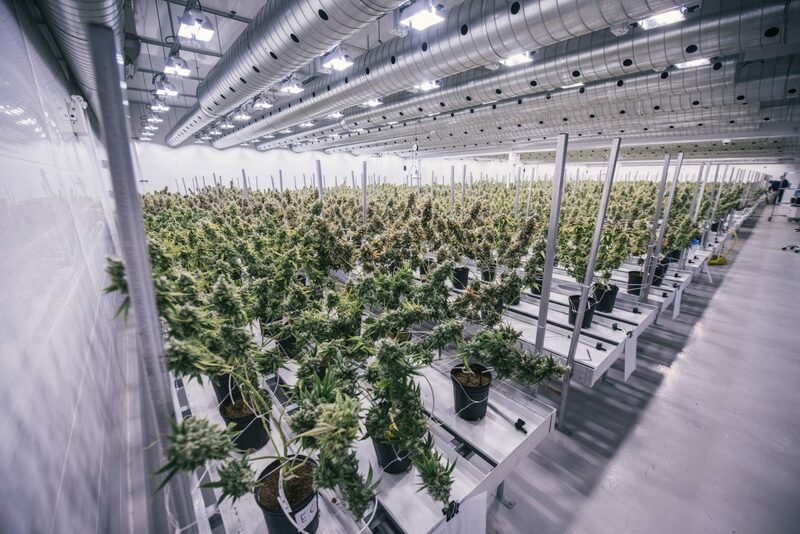 Once the Right is exercised, Acreage will become part of a leading global cannabis company with access to markets beyond the U.S. Until then, the two companies will continue to operate independently. Acreage Holdings Inc. (ACRG.U) stock rose over 9% to close at $22.49 on rumors of an acquisition by Canopy Growth Inc. (CGC) on Wednesday. Both company CEO’s are scheduled to appear on CNBC on Thursday morning at 6:50 am adding fire to the whispers. Acreage CEO Kevin Murphy and Canopy Growth CEO Bruce Linton are set to appear with Melissa Lee in the morning as the two companies are supposed to be finalizing the agreement this evening. 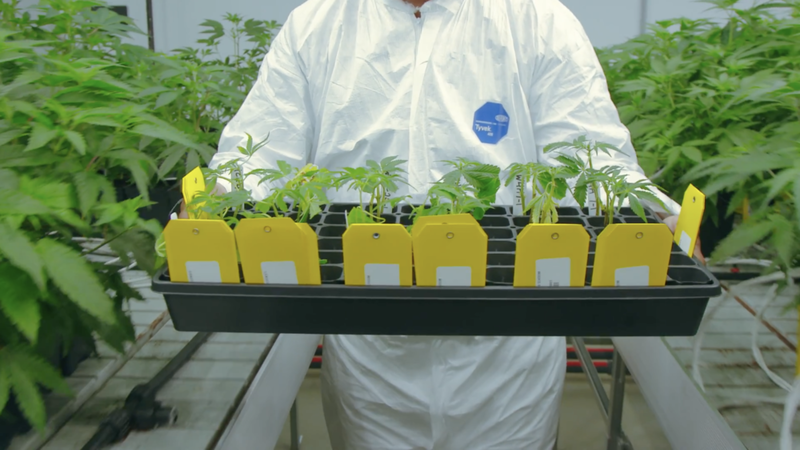 It had been suggested that Canopy had been looking for a U.S. company and Acreage is one of the largest multi-state operators in the country. In addition to that, the two CEO’s have appeared together frequently at various events and are familiar with each other. The biggest issue though could be the listing at the New York Stock Exchange. Canopy is listed at the NYSE, which has been steadfast about only listing Canadian cannabis companies and not U.S. based companies. The reasoning was that Canadian cannabis companies were not breaking the law since cannabis is fully legal in the country. However, in the U.S. cannabis is still federally illegal. This is not allowed as per the NYSE listing requirements. So, the question remains – how can Canopy maintain its listing at the NYSE if it acquires Acreage? Acreage did not respond to a request for comment. The company holds licenses in 17 states of which 12 are in operation and Acreage has licenses to process in 12 states, seven are operations. The company has licenses to operate 68 retail dispensaries in 12 states, of which 21 are currently operational in 10 states. The Botanist is its retail concept designed to appeal to both adult use and medicinal consumers. Acreage is licensed to open four stores in New York state home under the company name NYCANNA. The company is also planting its flag in Queens with its latest Botanist opening this past week on February 20. It is Acreage’s first dispensary in the New York City area. Its operation in Florida is the result of its purchase of Nature’s Way Nursery of Miami, which it acquired for $67 million in January 2019. Acreage plans to open 18 retailers in 2019 in the state. Its Michigan properties were the result of an agreement with Blue Tire Holdings reached in August 2018. Other states include Ohio, North Dakota, New Jersey, Massachusetts, California, Connecticut, Iowa, Maine, Maryland, New Hampshire, Pennsylvania, Oregon and Oklahoma. There are pending acquisitions in Rhode Island and the Form Factory in Oregon that has operations in Washington and California. 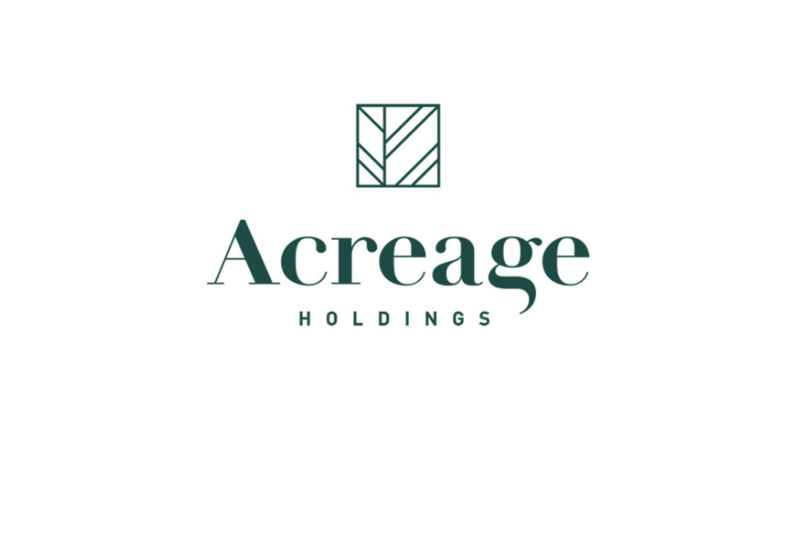 Acreage Holdings, Inc. (CSE: ACRG.U) (OTCQX: ACRGF) delivered fourth-quarter revenue of $10.5 million for an increase of 380% over the previous year’s $2.1 million. Acreage reported a whopping fourth-quarter net loss of $217.6 million. The pro forma revenue* for the fourth quarter was $22.9 million and the pro forma adjusted net loss*, which excludes certain non-cash charges and non-recurring items, for the fourth quarter was $10.8 million. The full year fiscal 2018 revenue of $21.1 million increased 173% over last year’s $7.7 million. The pro forma revenue* was $77.2 million for the full year fiscal 2018. The full year fiscal 2018 net loss of $219.7 million was primarily driven by non-cash charges and non-recurring items. The pro forma adjusted net loss*, which excludes certain non-cash charges and non-recurring items was $30.3 million for the full year fiscal 2018. The company has been on a tear with its expansion During the fourth quarter of 2018, Acreage opened two dispensaries under its The Botanist brand in Buffalo, NY and Worcester, MA, and acquired one dispensary in Thames Valley, CT, ending the year with 19 dispensaries (as of today, Acreage has 24 operational dispensaries). Growth doesn’t come cheaply. During 2018, Acreage spent over $200 million of capital in various strategic transactions and invested approximately $37 million to build out our operations. $46 million alone was spent in the fourth quarter of 2018. $22 million was invested in its subsidiaries and $15 million advanced to our managed entities to facilitate build-outs outs in the year. According to the company’s presentation, Acreage has $105 million in cash and cash equivalents and $149 million of highly liquid short-term investments on hand as of Q4’18, compared to $16M of cash as of Q4’17. The company raised $314M from pre-RTO private placement; completed RTO and listed on the Canadian Securities Exchange. Acreage President George Allen said at this time the company doesn’t anticipate raising more money. Acreage also announced it was acquiring Kanna, Inc. which holds a license to operate a cannabis dispensary in Oakland, CA. as the company enters the California market. It’s an all-stock deal valued at $11.5 million that is expected to close in the second quarter of 2019. That’s a bargain when one considers that a nearby dispensary is doing $40 million a year. Acreage said it will issue up to 460,000 Subordinate Voting Shares at a deemed value of $25 per share. Shares are currently trading in the mid-teens, but Allen pointed out that when the company did go public it was at $25 a share. “It’s a message to our shareholders, that we’re not willing to dilute ad nauseum shareholder value,” said Allen. “I could not be more excited about our first dispensary operation in California, especially one in a limited competitive market. While this is our first, it is nowhere near our last, as we expect to significantly expand our dispensary footprint in the state over the coming months,” said Kevin Murphy, Founder, Chairman, and Chief Executive Officer of Acreage Holdings, Inc. According to the statement, Oakland allows just 16 adult use dispensaries to serve a population of more than 400,000. The dispensary is located at 2019 MacArthur Blvd., in Oakland, but it will open in the second quarter of 2019, under Acreage’s dispensary brand The Botanist. Acreage Holdings Inc. (CSE: ACRG.U) (OTCQX: ACRGF) continues its push to add strength to its consumer team with the additions of Stacey Kawahata, as the Vice President of Consumer Insights and Brand Strategy, and Joen Choe, as Vice President of Marketing. Acreage has already established itself as a leader with its star-packed board of directors and continues to add key hires from top consumer brands. “Our long-term success depends on our ability to create differentiated national brands and products that connect with consumers. The addition of Stacey and Joen is a testament to our commitment to driving the growth of our brands and the industry overall,” said Harris Damashek, Chief Marketing Officer of Acreage Holdings. “They both bring an amazing track record and experience in creating, developing and growing breakthrough brands by connecting with consumers in culturally relevant ways.” Both executives will report directly to Chief Marketing Officer Harris Damashek and join a growing marketing organization with Acreage. As VP of Consumer Insights and Brand Strategy, Kawahata will be responsible for bringing deep consumer understanding to the center of Acreage’s product, brand, and marketing executions. 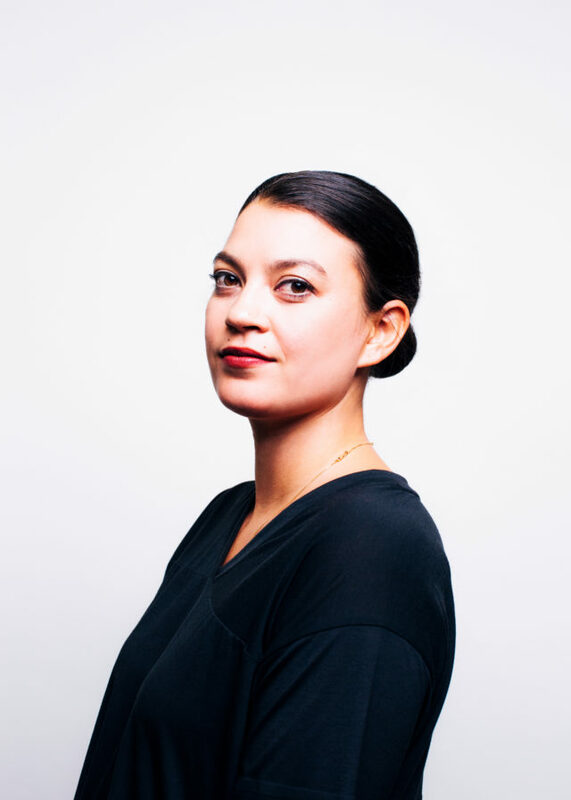 Prior to joining Acreage, Kawahata worked at VICE Media for more than four years leading global brand, content and partnership strategy for VICE’s commercial and editorial arm. She was also a leader in VICE’s internal agency, VIRTUE, working with a number of brands including lululemon (LULU), Under Armour (UA), and Apple (AAPL). In this role, Kawahata also led strategy across several VICE partnerships with companies such as Samsung, Diageo, and ABI. In her role at Acreage, Kawahata will be responsible for crafting experiences and brands that resonate with the many different consumer segments across the cannabis industry, and creating marketing strategies, programs, and executions rooted in consumer needs. As VP of Marketing, Joen will lead marketing strategy and brand management efforts across a growing portfolio of brands and retail concepts, including The Botanist, Acreage’s flagship retail brand. 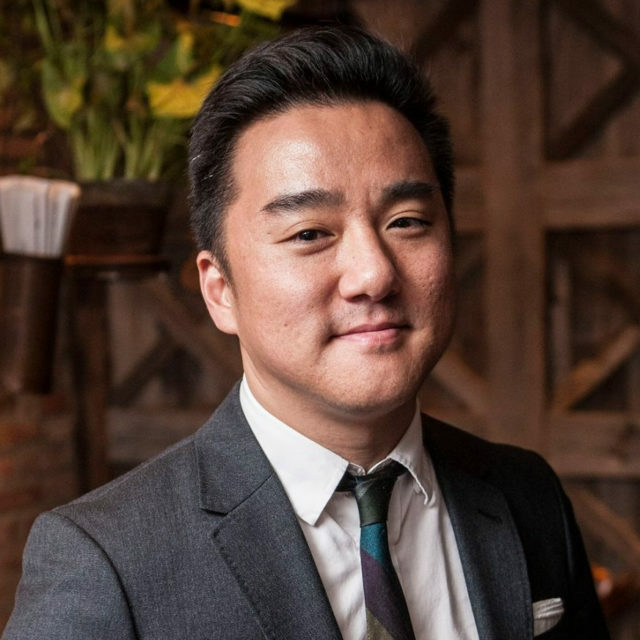 Prior to his position of VP of Marketing at Acreage, Choe drove brand and commercial marketing across a variety of industries, geographies, and sizes—from global icons like Nike (NKE), Luxottica, and Absolut Vodka to high-growth brands like vitaminwater (Coca-Cola), St-Germain (Bacardi), and Aviation Gin. In addition to his deep experience in brand and marketing leadership, Choe managed product and business operations and led media and communications in roles across multiple verticals. Choe also held a leadership role at a startup in mobile health and wellness, Tangram, with products sold at Apple, Best Buy, and Target before being acquired by Kakao Ventures. New York State Governor Andrew Cuomo announced his plan to legalize adult use cannabis in 100 days. The governor did not provide a lot of details but suggested it would continue to be a restrictive program. Of course, New Jersey also said it would legalize adult use cannabis but then found it has taken much longer to make adjustments to the rules and regulations of a conservative medical cannabis program. Cuomo did note that consumers would need to be over the age of 21 and he was very supportive of towns cities having the ability to opt out of allowing cannabis businesses. On May 15, 2018, New York City Comptroller Scott Stringer published a report estimating the potential size of the state’s legal cannabis market and how much tax revenue it would generate for both the city and the state. According to the report, the New York State cannabis market could see up to $3.1 billion in annual sales, with up to $1.1 billion being generated in New York City alone. In terms of tax revenue, legal cannabis could generate up to $436 million for New York state and $336 for New York City. Some lawmakers have even suggested this money could be used to fix the troubled subway system. A new report from ArcView and BDS Analytics is estimating the New York cannabis market could reach $1.6 billion by the year 2022, a big jump from the expected $263 million in sales for 2018. This would be the fourth biggest market in the U.S. The biggest market is California, followed by Colorado and Florida respectively. 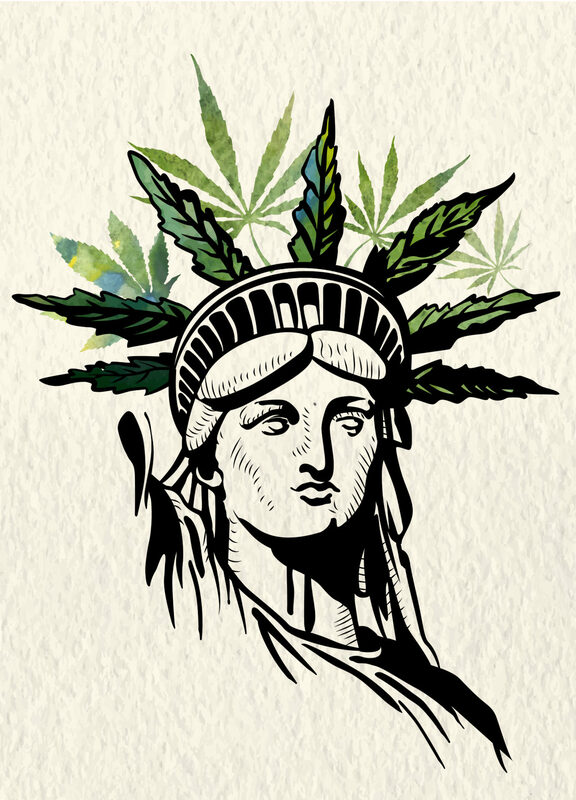 During the midterm elections, the New York State government shifted to Democratic control and it was expected that the new lawmakers would fully legalize cannabis. The efforts by Cuomo as expected to be approved in Albany. The tax revenue and jobs from fully legal cannabis would be a big boost to some of the needy areas in the state. Just this week, Canopy Growth (NYSE: CGC) said it was going to spend $150 million to build its first production facility in the U.S. after getting a license to grow hemp by New York. Canopy Growth Corp. will spend as much as $150 million to build its first production facility in the U.S. after the Canadian cannabis company was granted a hemp license by New York state. “I applaud the political leadership at the federal and state level that has allowed today’s announcement to become reality,” Canopy Chief Executive Officer Bruce Linton said in a statement. The company said it was reviewing locations in the Southern Tier region of New York State and said it would announce the winner within 100 days. Cuomo is under pressure to create jobs in depressed areas in upstate New York and cannabis jobs fit the bill. A study, published by Joblift, shows that cannabis growth in California is “steadily declining,” while New York State is experiencing strong growth. New York is now third in terms of gross domestic product and is experiencing a “surge in medical marijuana job postings,” with the study saying it could hold “the most potential for overall growth in the sector.” New York experienced two times more job postings (155 vs. 67) in the first half of 2018, compared to the prior year. Next comes the question investors want to know. 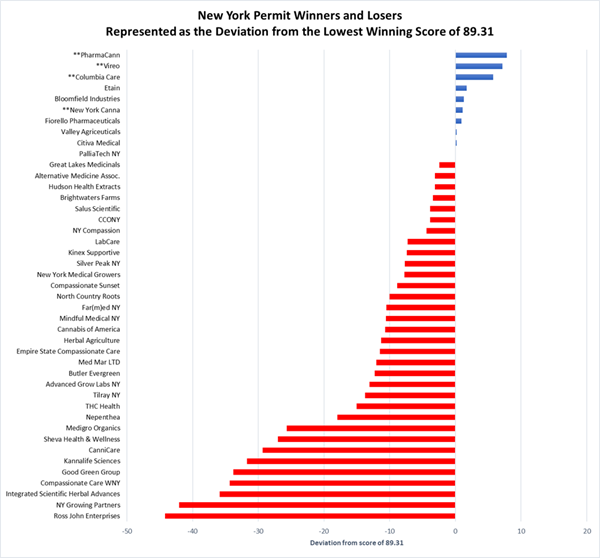 Who is poised to capitalize on the New York market? 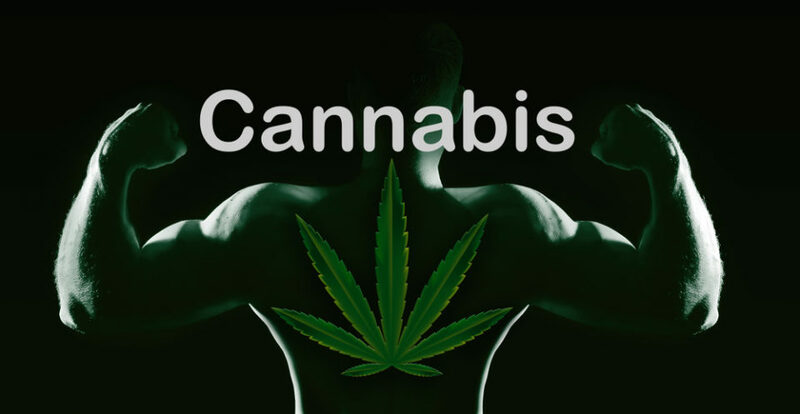 Cannabiz Media is a company that tracks license holders in states around the country. According to their data, it looks like MedMen Enterprises Inc. (CSE: MMEN) (OTC: MMNFF) is poised to be the big winner as a result of its acquisition of PharmaCann, which had the highest number of permits awarded in the state. MedMen acquired PharmaCann for $682 million in an all stock deal back in October. It not only doubled the reach for MedMen, but expanded its presence in New York. MedMen had acquired New York’s struggling Bloomfield Industries at the beginning of 2018. The company had been unable to pay vendors and was looking for new investors. Bloomfield was one of the original five licensees in New York. Vireo Health is next on the list. Vireo is a physician-led multi-state medical cannabis company, that says “It is committed to safely alleviating pain by providing patients with best-in-class cannabis products and compassionate care.” Unfortunately for investors, this company is still private. Although it did raise $17 million back in August and the company said that it was planning on going public at some point. Vireo is still making headlines as formers executives were set to go to trial at some point this year for smuggling cannabis oil from Minnesota to New York. The company was trying to move inventory to meet a New York deadline and the move was exposed due to a whistleblower. Dr. Laura Bultman and Ronald Owens, the company’s former chief medical officer and chief security officer. face felony charges of smuggling $500,000 worth of cannabis oil into New York. They face up to two years in jail and a $3,000 fine for violating Minnesota state medical marijuana laws. Next in line for number of permits is Columbia Care, which is expected to go public in the first quarter of 2019 following a merger with Canaccord Genuity Growth (CGGC), a special purpose vehicle. In October it was announced that the two companies would combine. The companies agreed that CGGC would be valued at C$60.7 million and that Columbia Care would be valued at US$1.35 billion. The deal is expected to close in the first quarter of 2019. Columbia was selected to be one of five licensees in Virginia and became the first U.S. company licensed in the European Union. It was recently awarded one of the six new licenses in New Jersey. Etain Health is one of the original five licensees in New York and it too remains a private company. It is female-owned only recently began to expand beyond the state lines as it looks to California as another market for its products. Acreage Holdings, Inc. (CSE: ACRG.U) (OTC: ACRZF) also stands to benefit due to its ownership of New York Canna, now known as Terradiol New York. New York Canna was originally formed in 2015. The initial shareholders of New York Canna, Inc. were intended to be New Amsterdam Distributors (NAD) and EPMMNY. However, NAD and EPMMNY were unable to reach an agreement as to EPMMNY’s contributions to the operating entity and the terms of investment. NAD says it was the sole shareholder of New York Canna when it began talking to Acreage among others. EPMMNY doesn’t agree with this assessment and recently filed a lawsuit asking for $400 million. EPMMNY says in its lawsuit that it was “frozen out” in 2016 and its stake reduced initially to 12.5% as NYCANNA merged with defendant NY Medicinal Research & Caring, which included NYCI Holdings, Impire Holdings and Acreage Holdings as investors. Firorello Pharmaceuticals also known as FP Wellness is a New York State only licensee. It is privately owned. The company lists its partners as The Clinic, Plant Consulting Group and LIU Pharmacy on its website. A report in the Daily Gazette said that Fiorello is building a medical marijuana production facility in Glenville and plans to open other dispensaries in Monroe, Nassau and New York counties. Valley Agriceuticals was supposed to be sold to iAnthus Capital Holdings Inc. (CSE: IAN) (OTC: ITHUF) in 2017 for $17.3 million, but that deal was never closed. iAnthus then acquired New York’s Citiva Medical for $18 million at the beginning of 2018. According to the original press release, Citiva NY’s license included a cultivation and processing facility and four dispensary locations to be located in Brooklyn, Staten Island, Dutchess County and Chemung County. Citiva’s proposed 2,000 square-foot flagship Brooklyn dispensary was slated to open in Q4 2018, and would be one of only two dispensaries located in New York City’s most populous borough, with 2.6 million residents. The statement said that Citiva’s Staten Island dispensary, would be the only Registered Organization serving Staten Island’s 500,000 residents and it was also slated to open in Q4 2018. The Dutchess County and Chemung County dispensaries are planned for the second quarter of 2019. Finally, Palliatech, which changed its name to Curaleaf Holdings Inc. (CSE: CURA) (OTC: CURLF) is based in Boston MA. It has locations in seven New York counties. Its website says more counties are coming. Near Manhattan there is a dispensary in Forest Hills in Queens. In the company’s last earnings announcement, it said that it estimates it will post revenue of $400 million in 2019 including revenue generated by the non-profits, and free cash flow of $100 million. Curaleaf expects to complete two acquisitions in the fourth quarter of 2018 in Maryland and Massachusetts. At the end of 2018, Curaleaf also expects to have at least 40 operational stores.